« It’s National Grammar Day! What a busy week! We had National Grammar Day on Monday, and today, March 8, is National Proofreading Day. For someone like me who lives this stuff on a daily basis, it’s downright exciting! The day is devoted to “mistake-free writing” and projecting “a professional image with well-written documents that are 100 percent accurate.” Started by Judy Beaver at The Office Pro, this day is designated because it was her mother’s birthday—and her mother loved to correct errors. As I noted on Monday, I’m not a total grammar geek but I do care about the correct usage of our language, and I’ve made a living for many years honing this skill. Lots of times I still have to look things up in a dictionary or my Chicago Manual of Style (the style manual for much of the book publishing industry). All manuscripts go through several phases of editing, and I’ve done them all. Generally, if I do one phase on a particular manuscript, I make sure that other people do the other two phases–there’s a different focus that has to take place at each phase. Editing—I call this the 10,000-foot view. I look at the big picture. I’m reading the fiction story and checking the plot, the pacing and flow, the characterization. In a non-fiction manuscript, I’m seeing if the organization works and makes sense. Any changes I suggest at this point are on the macro level—moving chapter 3 to become chapter 1, for instance. Or looking for that loose end in the mystery that the writer forgot to tie up (“What happened to so-and-so?”). The author makes changes (or not) based on my suggestions, and then the manuscript goes to a copyeditor. Copyediting—This is more like the 1,000-foot view. Now that the editor has put the manuscript in good shape, if I’m in this role, I’m reading closely for sentence construction—dangling modifiers, run-ons, and inconsistencies. I fact check. I query if something doesn’t make sense, if a transition is needed, if a character’s way of speaking doesn’t sound real based on how he or she has been described by the author (“Would he really say this in this way?”). Proofreading—This is the 10-foot view. If I’m in this role, sometimes I’m working on a manuscript, but often at this phase I’m looking at a pdf of typeset pages—which means I have to check the table of contents to make sure the titles and page numbers are correct, I check all the folios and running heads, I check the look of each page—marking widows and orphans (those random one or two words at the top of a page, or the lone line at the bottom—these just look awkward). Then I read every word. Even a clean manuscript can have random errors show up when the document is flowed into the typesetting program (a hidden tab in a Word document can suddenly rear its ugly head and space words far apart when typeset). Proofreading is probably my favorite. It’s that red pen mentality. I’m looking for errors only because I want the book, the author, and the publisher to put their best foot (feet?) forward. 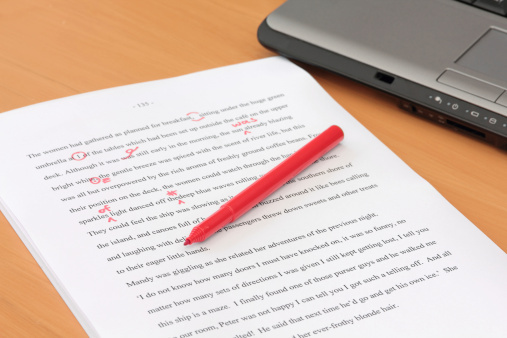 The three types of editing take different skills. In my Editing class, I give my students practice in all of these areas, telling them that they will probably find an affinity for one and not like the others so much. But I also tell those who want to become editors that they should hone their grammar and punctuation knowledge anyway, because the copyediting and proofreading jobs are often the entry level positions in publishing companies. From there, they can move up, since often editors and acquisitions editors are hired from within, from people who have been with the company and understand the ethos there. (2) If you’re not absolutely sure of the spelling of a word, don’t guess. Look it up. Dictionary.com is your best friend. (4) Then, read it again starting from the bottom paragraph backward, a paragraph at a time. This helps you get outside your own flow and see errors you might skip over otherwise. (5) Electronically, go back and do a search for an open parenthesis (to make sure that you always have a matching close parenthesis), an open quotation mark (to make sure you always have a the appropriate closing quotation mark and to make sure any inner quotation marks are single and that they are both there). And get rid of those double spaces between sentences! (6) Be aware of your own weaknesses. If you know you tend to write run-on sentences, watch for that in particular. If you know that possessives always mess you up, do a search for apostrophes and check each one for correct usage. This will clear up a good number of your errors. It never hurts, however, to have someone else look over an especially important document—like a cover letter or resume or manuscript submission. Let’s put our best foot forward—both of them! Thanks for continuing to get the word out about the need for accuracy in order to establish a professional image. Love the different editing-phase viewpoints. Having worked in each of these phases, i know these descriptions are very apt. Sadly sometimes writers think they only need one phase (proofreading) because their work is already perfect and only requires a check for typos. Even a Pulitzer Prize-winning author needs an editor. This is great. I’m also a fan of that red pen mentality and have considered finding work as a copyeditor. The tip to read backward, paragraph by paragraph, is one I haven’t heard before, but it sounds helpful. I also didn’t realize that Chicago Style is the norm in publishing. I’m glad now that I have some experience with it! Thanks for the tips.